Harefield Radio | The brightest sound around! 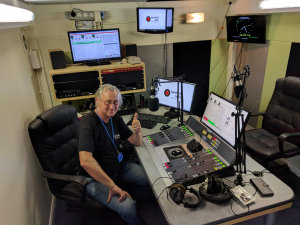 Harefield Radio is your community station for Harefield village and the world famous Harefield Hospital. We have been broadcasting since 1972 from out studios located at the hospital. We were the very first radio station in the UK to broadcast 24/7 to a hospital on an FM frequency. Over the years, we have interviewed many famous guests including Ken Bruce and Alan Deddicote of BBC Radio Two with Adam Lewis hosting a two hour live show with them. Other guests have included the late Ronnie Barker, Eric Morecambe and Roy Castle. With investment from both the trust and other charities and supporters, we were able to purchase and install a new dedicated digital studio complex in 2012. Take some time to browse around our site, and if we can help you any further, please feel free to contact us.